A woman fell out of a ride at a carnival and sprained her wrist after the ride started before she and her boyfriend were secured, she said. Ida Siegal reports. A woman fell out of a ride at a carnival in Queens when she says it started before she and her boyfriend were secured, leaving her with a sprained wrist. she said. Tiffany Karl, 19, and her boyfriend got into the basket of a spinning ride called the Zipper at the Astoria Park Carnival in Astoria around 11 p.m. on Saturday, she told NBC 4 New York in an exclusive interview. The gate to the basket was still open and Karl was only halfway inside when the ride started moving, she said. "I was literally halfway in ... and the next thing I know, the guy fell and I fell, and Chris is hanging on." Tiffany Karl's boyfriend Chris Bravo held on as the ride was swinging. Karl sprained her wrist and bruised the side of her body in the fall, she said. Her boyfriend was lifted around 20 feet into the air by the ride and had to cling to the basket, he said. “I just see Tiffany screaming, ‘Hang on, hang on.’ And I see everybody with their hands on their head like, ‘Oh my God, what’s going on,” he said. 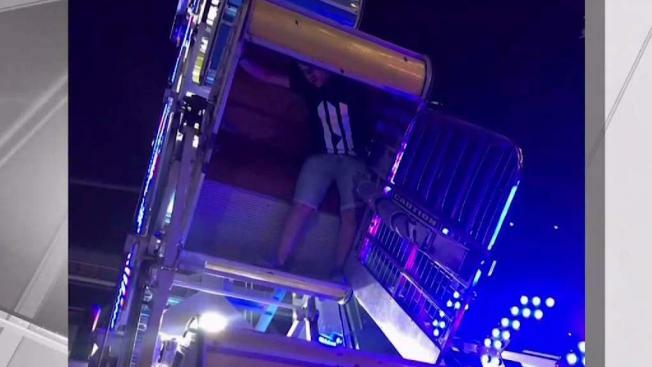 A consultant for Dreamland Amusements, which operates the carnival, told NBC 4 New York the ride lifted the boyfriend around eight feet into the air, not the 20 feet he claimed. The consultant said workers dealing with crowd control failed to close the door. Dreamland Amusements has since posted extra staff at the ride.